Today we stand right on the edge of Great Lent, for the weeks of preparation to follow our Savior to His Passion begin tomorrow. We have already been challenged to prepare with the Sundays of the Tax Collector and the Pharisee, the Prodigal Son, and the Last Judgment. Now it is the Sunday of Forgiveness, when we are reminded that we must forgive one another if we hope to receive God’s forgiveness for our sins. 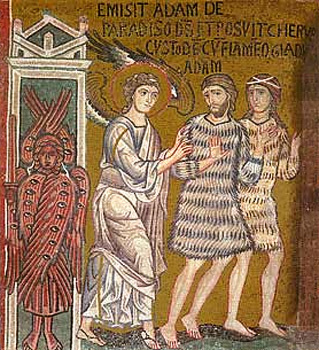 Every time we pray the Our Father, we say “and forgive us our trespasses as we forgive those who trespass against us.” Christ teaches in today’s gospel lesson that “If you forgive men their trespasses, your heavenly Father also will forgive you; but if you do not forgive men their trespasses, neither will your Father forgive your trespasses.” It is impossible, of course, to earn God’s forgiveness or put Him in our debt by anything that we do. Before His infinite holiness, we stand in constant need of mercy and grace. At the same time, it impossible to open ourselves to receive His mercy and grace if we do not extend the forgiveness of which we are capable to those who have wronged us. If we ask for the Lord’s forgiveness and refuse to forgive others, we are in the false position of those who want something for themselves but will not give it their neighbors. That is a form of selfishness that reflects a lack of love for those in whom we encounter Him every day of our lives. It is a form of idolatry in which we imagine that we are serving a false god who simply does our bidding rather than a Lord Who calls us to die to self as we share more fully in His life. Forgiveness is not some kind of commodity that can be hoarded greedily. It is ultimately a divine energy of the Lord in Whom we participate by grace. If we refuse to forgive others, we refuse to be healed, transformed, and illumined like an iron left in the fire of the divine glory. We refuse to be truly in communion with Christ; indeed, we refuse Him. But if we forgive, even as we acknowledge the imperfection of our efforts to control our thoughts, words, and deeds toward those who have offended us, we open ourselves in humility to become more like our Savior in holiness by the power of His grace. Like the rest of the Christian life, forgiveness is not simply a matter of how we feel about God, our neighbors, or ourselves. It is not about whether thoughts of past wrongs or future fears pop into our heads. It is not about whether we particularly like someone else. Forgiveness occurs when our vision of those who have wronged us is clarified or restored such that we see them not in terms of past wrongs, but as those who bear the image and likeness of God. Only our inflamed passions keep us from seeing our neighbors this way, for pride tempts us to hold on to anger and judgment that quickly condemn anyone who has ever dared to cross us. 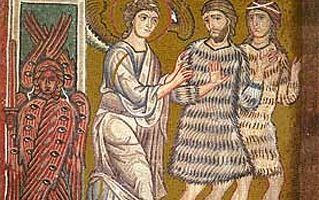 The “quarreling and jealousy” that St. Paul associates with “the works of darkness” will never end in our own souls if we do not find healing from such distorted desires. That process of healing is a way of speaking about putting “on the armor of light,” of “put[ting] on the Lord Jesus Christ, and mak[ing] no provision for the flesh, to gratify its desires.” “Flesh” in this sense refers to our corrupt humanity, enslaved to death and the war of the passions within us. Adam and Eve were cast from Paradise when they stripped themselves naked of the divine glory by their prideful disobedience. They diminished themselves to a life focused on “mak[ing]..provision for the flesh, to gratify its desires.” We do not have to look very closely at our world or into our own souls in order to see that we have followed our first parents on a path out of Paradise. When their son Cain murdered his brother Abel, it became abundantly clear how powerful the passions are at destroying human relationships as God intended them to be, even within our own families. If we are truly in Christ, the New Adam in Whom all the corruptions of the first Adam are set right, we must be in the processing of healing from the self-centered desires that separate us from Him and one another. The weeks of Lent provide us with profound opportunities to open even the darkest corners of our lives to His brilliant light. But no matter how strictly we fast, how fervently we pray, or how generously we give to the needy, we will be unable to receive God’s forgiveness if we do not forgive one another. That is the clear teaching of Christ in today’s gospel lesson. What greater sign is there of our brokenness than how easily we offend, harm, and disregard one another? Indeed, we often enjoy doing so and come up with all kinds of reasons to justify hateful thoughts, words, and actions toward others. At Forgiveness Vespers this evening, we will personally bow before one another as we ask for and extend forgiveness to everyone in the parish. We begin our journey toward the deep mystery of Christ’s death and resurrection with humility and reconciliation. Since none of us has lived as faithfully as possible, we have all weakened one another spiritually, for we are members of one Body in Christ. Now is the time to grant to one another the forgiveness that we ask from the Lord as we prepare to follow Him to the ultimate manifestation of His forgiving love in the cross and empty tomb. Instead of wasting time and energy by judging others or holding grudges this Lent, we must focus on participating as fully as possible in the restoration of the human person that Christ has brought to the world. Since we have put Him on in baptism, we must live in a way that reflects and reveals His mercy and blessing. The Lord is very clear about what this means: If we want forgiveness for our sins, we must forgive others for their offenses against us. The prodigal son had no claim to restoration as a son, and he knew that, but the overwhelming love of his father healed the deep wounds that the young man’s behavior had caused. If we want to open ourselves to the unfathomable mercy of our Heavenly Father, we must become channels of that same mercy to others, despite our unworthiness. If we are truly “partakers of the divine nature” by grace, our Lord’s forgiveness will become characteristic of who we are. (2 Pet. 1:4) Like an iron left in the fire takes on the qualities of the fire and conveys heat and light to other objects, those who truly share in Christ’s life will share what they have received with others, especially those they are tempted not to forgive. Like prayer, fasting, and almsgiving, forgiveness requires a commitment of the will to do what is pleasing to God and is probably not immediately appealing to us. Like these other practices, forgiveness is a teacher of humility because it reveals our weakness. Like the healing of any passion, embracing forgiveness is a journey that begins with actions of thought, word, and deed that hardly seem sufficient to the task. God is gracious, however, and accepts the small acts of which we are capable. We cooperate with His grace as we do what we can to turn our attention away from the remembrance of past wrongs, to hold our tongues when we are tempted to remind people of their failings, and to say “I forgive you” even when we have a long way to go in fully embracing the meaning of those words. That should not be surprising, of course, because forgiveness is our participation in God’s forgiveness. Before His infinite holiness, we cannot claim to have mastered forgiveness or to have accomplished anything simply by our own power. For us who are so accustomed to the darkness, it will be uncomfortable to open our eyes just a bit to the brilliant light. For us who are so addicted to our self-centered desires, it will seem impossible not to gratify them. But when we know our own weakness, then we will know how much we need His gracious strength, which conquers even the tomb. This Lent, let us open ourselves to the Lord’s grace by showing His mercy to others, especially those who have offended us. There is no other way to follow Christ to His Passion and the brilliant glory of His Kingdom.